• non-linear dynamic analysis (time-history or response-history analysis). Linear time-history analysis is not explicitly mentioned as an alternative to linear modal response spectrum analysis. Unlike US codes, which consider the linear static analysis as the reference method for the seismic design of buildings, Eurocode 8 gives this status to the modal response spectrum method. This analysis procedure is applicable for the design of buildings without any limitations. The linear methods of analysis use the design response spectrum, which is essentially the elastic response spectrum with 5% damping divided by the behaviour factor q. Internal forces due to the seismic action are taken to be equal to those estimated from the linear analysis; however, and consistent with the equal displacement rule and the concept and use of the behaviour factor q, displacements due to the seismic action are taken as equal to those derived from the linear analysis, multiplied by the behaviour factor q. 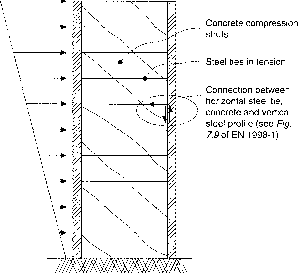 In contrast, when a non-linear analysis method is used, both internal forces and displacements due to the seismic action are taken to be equal to those derived from the non-linear analysis. The use of a linear method of analysis does not imply that the seismic response will be linear elastic; it is simply a device for the simplification of practical design within the framework of force-based seismic design with the elastic spectrum divided by the behaviour factor q.